Sometimes I read graphic novels as well and this is one of them. The ‘A Game of Thrones’ prequel. 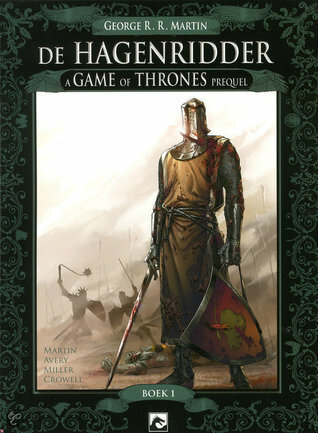 I have not read a book from the series yet, except this prequel who has a little series of itself as well. When I once started in the first novel of the ‘A Game of Thrones’ series, it was hard to follow as a start. But this graphic novel isn’t hard to follow at all which I didn’t expect because I expected that the graphic novel with the prequel story would be quite complicated as well. This was my prejudice. The story is about a young squire named Dunk. His master died and he wants to fulfill a dream. In this story of fourty eight illustrated pages, a lot is going on. Who can he trust on the road to become a real knight? The young boy Egg who walks away from home and wants to become a squire? This is only the first book of a little series. The illustrations are nice and the writing style is easy, not too complicated and made clear by the illustrations. Publisher: Dark Dragon Books B.V.